Kitchen cleaning is typically seen as “Due Diligence”, helping towards minimising the health risks to staff and the general public. Since the introduction of the Food Safety Act 1990, and in the advent of further enforcements of this act, like the Food Safety (General Food Hygiene Regulations) 1995 and Food Hygiene (England) Regulations 2006, stricter regulations are continually being enforced on the catering industry. Knowing what the best procedure is to work within these regulations can be difficult. This is where Champion Cleaning Services come in. 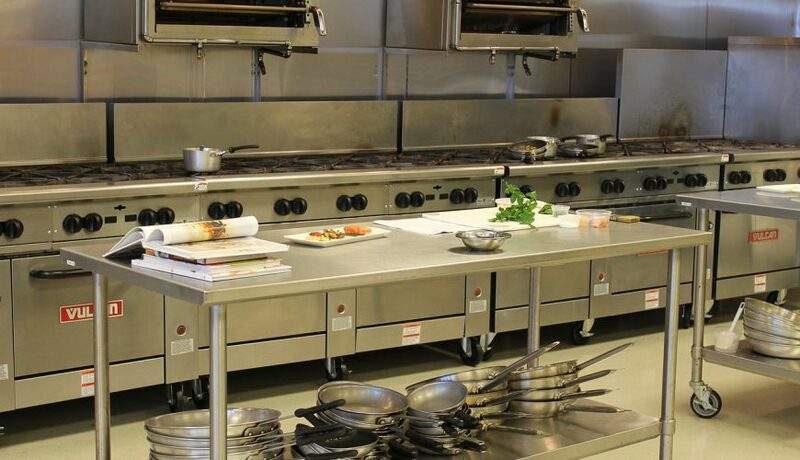 The cleaning and maintenance of commercial food preparation areas must always meet the highest standards of hygiene. No matter how thorough the daily cleaning routines may be, grease and grime will begin to build up on extraction fans and canopy ducting, lights and light fittings, ceilings, floors and a whole host of hard to reach areas behind static equipment. Champion Cleaning Services have the experience and the skills to carry out a clinical deep clean which will tackle areas overlooked by conventional cleaning techniques. Using steam extraction in addition to traditional manual chemical cleaning, all surfaces, fittings and fixtures are left germ free, clean and ready for use safely. Kitchen deep cleaning is always tailored to suit the individual needs of the customer. This area includes structural cleans, high level work, ventilation canopies, hot cooking equipment, ancillary equipment, floors and complete kitchen deep cleans. Our kitchen deep cleaning service is scheduled to fit around the needs of your business, which may include weekends or overnight cleans. Our trained cleaning technicians will arrive at a time best suited to you to thoroughly deep clean your kitchen and bring it up to a standard that you will be proud of. Taking the hassle away from you, we will clean your entire kitchen from walls, floors and ceilings to extraction systems, canopies, fryers and cooking equipment, making sure that your kitchen complies with the current legislation so that you can get on with your business, knowing that you are fully compliant. If you are considering a kitchen refurbishment, upgrade or modification, our professional deep clean service will make sure that you meet hygiene standards prior to inspection. Champion Cleaning Services provides a diverse and extensive range of industrial factory, warehouse, high level, and overhead cleaning services for many different business types: local, national, and international. Factory and warehouse cleaning can include managing a wide range of surfaces including the internal structure, high level racking, automated racking systems, flooring, roller shutter doors and internal & external cladding. Clients often require these environments to be upgraded in terms of cleanliness, possibly due to change of use, changes in the goods and stock held or simply just to satisfy the auditing procedures of a new or existing client. Whatever the reason, we can provide an excellent and professional result. As specialist factory and warehouse cleaning contractors, we are often involved with very large buildings and warehouse premises, some are vacant, others are in operation 24 hours, 7 days a week, where safety considerations are of paramount importance. In some circumstances we will already be carrying out factory cleaning services, such manufacturers may also have their own storage facility, we can also undertake a warehouse cleaning service. Cold storage facilities do present unique cleaning problems, conventional cleaning procedures cannot be used when operating temperatures can frequently be -18 degrees. It calls for specialist help. These facilities usually have insulated white wall cladding which can become quite soiled through air movement caused by chiller units and fork lift truck activities. Because most are used for food storage, presentation of the environment is important. Champion Cleaning Services are experienced and trained to manage this type of specialist cleaning and we can advise and assist with legal compliance too.